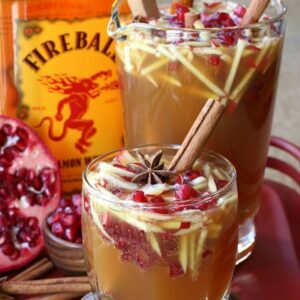 Make these Fireball Whiskey Cheesecake Shots at your next party! These tasty, no bake dessert shots are going to be the star of the party! Love boozy desserts? Yep, we do too. Also try our Fireball Apple Fritters, the fun Upside Down Pineapple Whiskey Cakes and one of our all time favorite desserts, Bananas Foster. 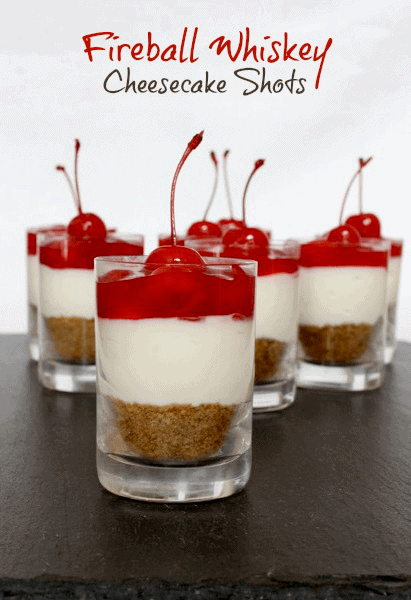 We love making dessert shots like these cheesecake shots for parties! They’re a perfect make ahead, no bake boozy treat that everyone is going to love! Actually, we make quite a few dessert shot recipes, we got a whole collection you can check out right HERE. Sometimes you don’t feel like having dessert after a big meal but you just want something sweet…dessert shots are the best answer. The other reason I like making dessert shots is because they are so easy. 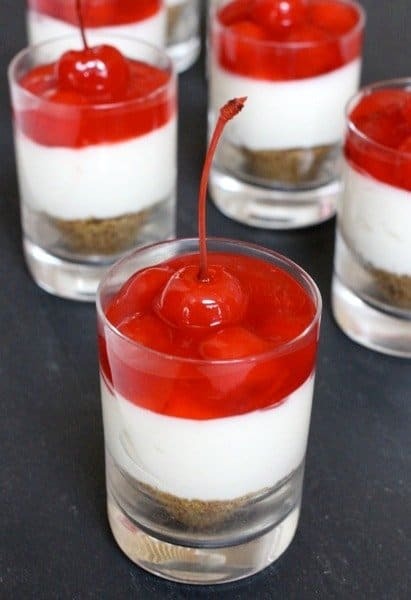 Take these Fireball Whiskey Cheesecake Shots, we start with a store bought topping, add a couple of shots of Fireball to it and the topping is done. How Do You Make No Bake Cheesecake? Again, totally easy. Just cream cheese, sugar, lemon juice, vanilla and cream. Beat it up and chill. You can use no bake cheesecake in so many dessert recipes too. Or simple spread it out in a store bought graham cracker crust and dessert is done! Even if you don’t have a store bought crust, you can easily make one using graham cracker crumbs or crushed graham crackers. Mix them with melted butter and sugar, press them into a pie pan and bake. For these cheesecake shots we aren’t actually baking the “crust” in the bottom of the shot glass, but it’s a dessert eaten with a spoon. So it works totally fine. If you’re not a Fireball Whiskey fan? No problem. You can use regular whiskey, vodka, or rum too! Pretty much any alcohol that you think goes well with cheesecake flavors is going to be great in this recipe. Moonshine? Yes. like I said, pretty much anything. Looking For More No Bake Desserts? You’re in the right place! We’ve got a lot of easy, party worth desserts to share with you guys that I know you’re going to love! These fun desserts shots are perfect for parties! A no bake, make ahead dessert is always a win! 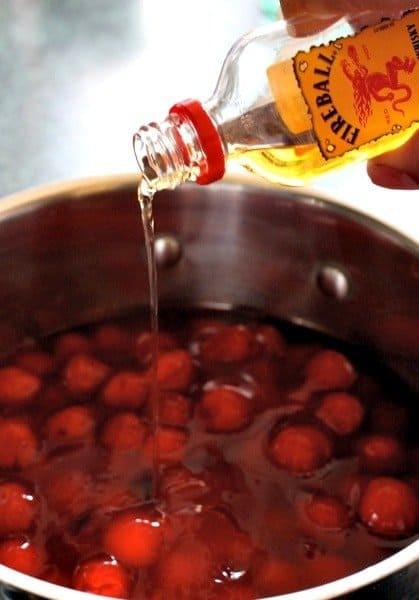 Combine the cherry pie filling and 2 shots of the whiskey into a bowl and stir together well. Mix the graham crackers crumbs, brown sugar, melted butter and cinnamon together in a separate bowl, stirring until all the graham crackers are coated with the butter. Add the cream cheese, lemon juice, have cream, sugar and whiskey into a large bowl. Using a hand mixer, blend until the cream cheese is smooth. Add 2 tablespoons of the graham cracker mixture into the bottom of each shot glass, pressing down to make a crust at the bottom. Using a teaspoon, scoop out enough cream cheese mixture to each shot glass to fill 3/4 of the way full. 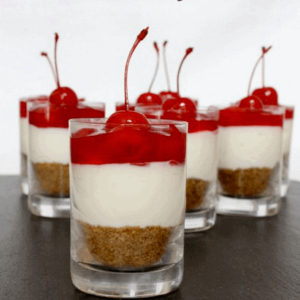 Add the cherry pie topping on top of the cheesecake mixture to fill the shot glass, then repeat with the remaining shot glasses. 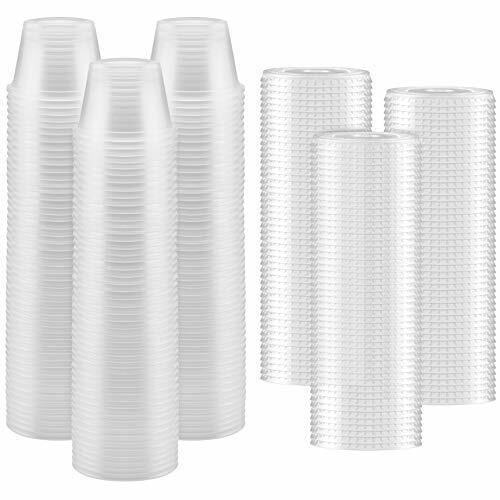 Refrigerate until ready, then top each shot glass with a cherry before serving. 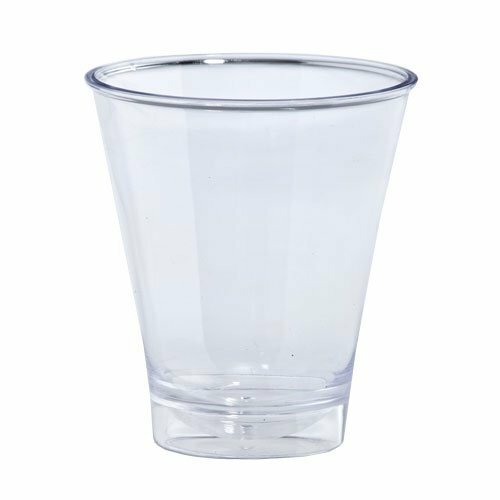 Makes about 30 shots, depending on the size shot glass you use. Also can be made in a regualr pie plate for a whole dessert. The ingredients lists brown sugar but nowhere in the instructions is brown sugar noted. In or out? In! Good catch, thanks. I fixed the recipe. The brown sugar goes in with the graham cracker crumbs for the crust. As if I needed one more reason to love Fireball! Awesome! Thanks Cat – they’re loaded with it too! could you use a cream liqueur instead of heavy cream, I wonder? You think like me Dee Dee! I don’t know if you want to sub the whole pint of cream for cream liqueur but you could definitely add in a few tablespoons. Let me know how it goes! Well .. it might have worked if you used fresh heavy cream (half n half would curdle) and a good cream liqueur, like Irish or cream tequila and left out the juice … but since the recipe calls for citrus juice … most likely it would curdle .. with the extra additive that has an acidic base it really raises the risk of ruining your drink. Guess ‘if it isn’t broken – don’t fix it’ comes in to play here. I’m sure there’s many ways to make this, you’re right. Really just getting the whiskey in there is what matters! For a quicker version, can you use the Jell-O instant Cheesecake mix??? Now that’s some good thinking there Belinda! Absolutely! I wonder if you can use brandy instead of whiskey? Would it turn out OK.
Karen- You could absolutely use brandy, it would be great! Let me know if you try it! Trying a batch tonight….also trying alternate with apple pie filling…….. If you make as a cheesecake, do you just cook as normal cheesecake or not cook at all? Nope, no need to bake Jonelle. This would just be like a regular no-bake cheesecake if you put it in a pie tin with the graham cracker crust and the cherry pie filling on top. The no-bake cheesecake is more creamy, not as set as a baked cheesecake, but really good! Can fireball whiskey cheese cake shots be frozen. so i can make ahead and use later. I wouldn’t recommend freezing them, no. But what you can do is make the filling and the topping a few days ahead of time and then just assemble the shots when you’re ready! Would it matter if I used Fire Jack instead of Fireball? Nope, not at all Lori! Enjoy! 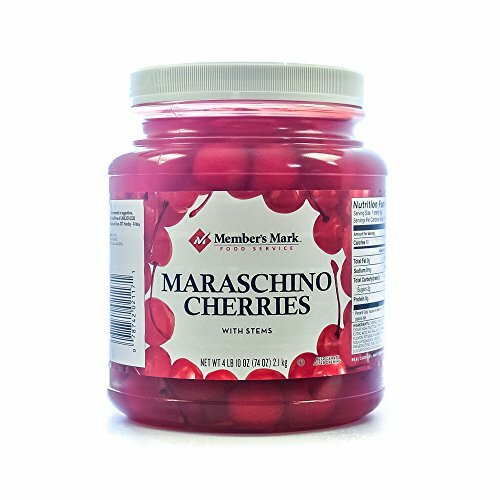 I wonder how you could make these stronger. 4 oz over 10 shots isn’t a whole lot, let alone 30 shots. Lilith, you can make them as strong as you want to, just add more Fireball. 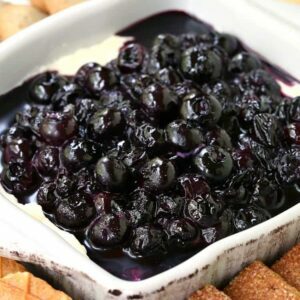 Keep in mind that the filling and cherry topping would obviously get much looser and might not set up as well. 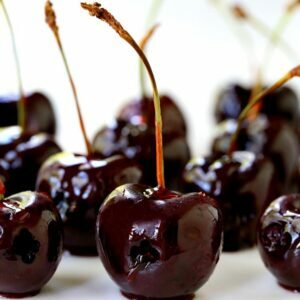 These are just intended to be a fun dessert with a little kick of whisky, like an extract that boosts the flavors. It’s really not intended to be a cocktail. But let me know how it goes!